On a very bleak day several years ago, the postman knocked on my front door with a package. I wasn't expecting anything so I was surprised when I saw it had my name on. I took the package back to my bed, which I'd barely been able to leave for the past month, and started to open it. I pulled out a pretty box and was intrigued to hear it rattle with things inside. On opening the box I found it was packed full of lots of little treats; each clearly specially selected with the sole purpose of making my day a little easier and brighter. Overwhelmed with gratitude, I went on to open the small card I'd found at the bottom of the box. As I read the message inside, I burst into tears. At a time when I felt more lost and afraid than I'd ever imagined possible, someone was thinking of me. Someone really cared and they'd put together this special package just for me. When you can't leave the house very often, anything arriving through the post takes on greater significance. That package completely turned my day around and made me feel a lot less alone. The incredible person who sent that package was Sophia. I don't think she'll ever know how much that small act of kindness has meant. Especially now that it has gone on to inspire this my 'hug in a box' business which has been quite literally life changing for me. Her thoughtfulness and kindness brightened my day then and continues to now with every BearHug I send. It breaks my heart to say that Sophia is currently very poorly with Lyme Disease. Despite the fact that she faces unimaginable levels of pain every day, there are no appropriate treatment options available to her in the UK. She is now having to fundraise to access treatment in America. I'm desperate to help her however I can. I couldn't think of a better way to do my bit than by building a BearHug in her honour. The Sophia Box is designed to match the original package Sophia sent me as closely as possible - I've tried to match every item like for like. Just like the package I received, the Sophia Box contains tasty treats, hand cream, lip balm and bath salts. Sophia sent me a floral notebook, so I have included the ever so pretty Liberty floral colouring book. I've also included a 'Big Hugs' coaster as Sophia's lovely words in her card felt like a big hug. The Sophia Box is available to order here. 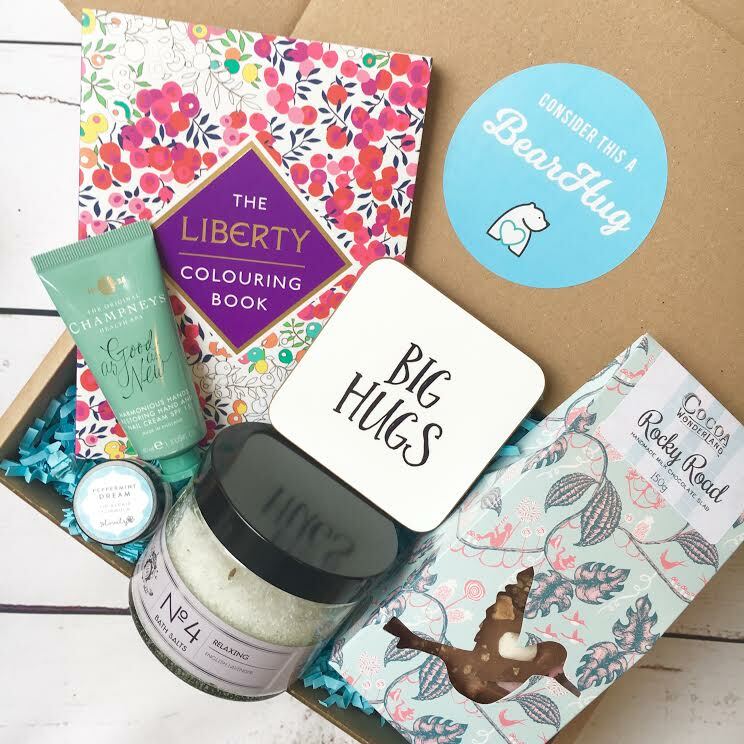 All profits from this gift box will go straight to Sophia's fundraising page here. This page is also where you can read more about Sophia and donate directly if you'd like to.